PACHELBEL’S CANON played as we ate bagels and Philly cheese lite this morning. The dining room window to the terraza was open to enjoy the 58-degree air in almost-August under blue skies at 8 a.m.
I’ve been inching through the manual of my new Canon SX520 and, as usual, sighing and rolling my eyeballs at how much technology can be crammed into a small space these days. Whereas I am in favor of high technology, my enthusiasm wanes when I have to deal with its innards personally. The first day after the camera’s arrival discouraged me. I only wanted a far better zoom, and simpler cameras with great zooms are available. I began to wonder why I had not purchased one of those simpler options. I woke up for a spell in the middle of Thursday night, thinking: I’m gonna sell that thing and buy something easier. I have pulled similar stunts. About three years ago, I bought a Samsung Smartphone. I sold it at a significant loss within the week. Didn’t care for it. My main objection was the ringtone, which was too pissant for my tastes. Didn’t ring long enough. Yeah, I know. You can add others. Learned that later. I returned to my previous, ancient, Nokia phone. You would laugh at it. It does two things only. It makes calls. It sends messages. Period. It does have powerful ringtones that would startle the dead. Back to the camera. So I woke up yesterday and continued reading the Canon manual (online) while fiddling with the camera. I began to like stuff more and more. It’s pretty incredible, things it does. I stood on the upstairs terraza and took a closeup of the chimney on a house down the street, crystal clear. No wobble at all. How’s that possible? I also removed the neck strap, which was a colossal annoyance. I went back to Amazon, the U.S. version this time, and ordered a perfect wrist strap and a beefier memory card. They are en route, no import tax due, I’m told. Looks like I’ll keep the camera. I took it downtown yesterday afternoon for my daily coffee siesta at a sidewalk table facing the beautiful plaza with towering trees. I snapped a few shots, but nothing notable. Then I got in the Honda and drove home, passing the small church above. We finished the bagels and Philly cheese lite. I watered the plants on the downstairs terraza. It’s a lovely day. I wonder what kind of day it was when the Spaniards tortured the Indian chief in the church. Maybe there are still blood stains on the stone floor. Maybe that’s why the church is usually locked. Catholic shame. * Don’t they know that #indianlivesmatter? That photo! Wonderful! Did you take it in black and white, or convert it from color? Pachelbel’s Canon always makes me sad. Was played at my daughter’s wedding for the bridesmaid’s entrance. That marriage didn’t turn out so well. I usually can read a camera manual only so much and then toss it aside and head out with the camera to see what I can do with it mano a mano. Yup, them Spaniards were nasty people back in the day. I would be searching for a window to crawl through in that church. Angeline: The photo was taken in color. I changed it with my trusty Fotor. The camera has the capacity to take photos in black and white and in sepia too, I think. Just have not gotten that far in the instructions. My daughter’s first marriage did not turn out well either, but she gave matrimony another shot years ago, and it seems to be going splendidly, which delights me. I don’t know if Pachelbel’s Canon was part of the mix. As for Spaniards being nasty back in the day, I submit that most all people were nasty back in the day, and many still are, but that’s a topic for another day. As for crawling through a window into that church, I found the door open once, years ago, and I went in. That was before I knew its history. I don’t recall the interior now. It’s a lesser-taken, secondary route from downtown to where we live. I have seen it open only about two other times. I don’t know why it’s usually locked up. Maybe there is blood on the floor. It’s a very small church. Most would call it a chapel. We have attended Sunday mass in that chapel a few times. Well, that’s interesting, señor Patzman. So it’s open on Sundays. Did you see any blood on the floor? Hear the tortured screams of Indian chief ghosts? PS: One thing that makes that photo excellent is that there were no cars or even 21st Century people standing there, which was strange because the street passing to the left is a major thoroughfare. Hey Felipe: One fine image señor! To me, Black & White photos really are more appealing to the eye. Jeff: I had to look at the U.S. Amazon website to get any info on that camera. The Mexican site is notable for its lack of detail. I like it because it’s small, and it has an 8X zoom which is far better than my Kodak EasyShare at 3X. I’ve had a couple of Fuji Finepix cameras, and I liked them. Mop bucket? Well, I’ll be darned. Yep, black and white photos have a certain panache. We are of one mind. Fortunately I never heard Pachelbel’s Canon before. Too bad the music was rediscovered in 1919. It gives me a headache. Most of the photos I took on my Kodak Brownie were also in B & W, until I got my first 35mm camera. My gripe about early color film was the expense and that the photos faded over time. My favorite B & W photographers were Edward Weston and Yousuf Karsh. Andrés: I am amazed you’d never heard Pachelbel’s Canon. It’s very well known. Also surprised it gives you a headache. You’re a weird one, amigo. 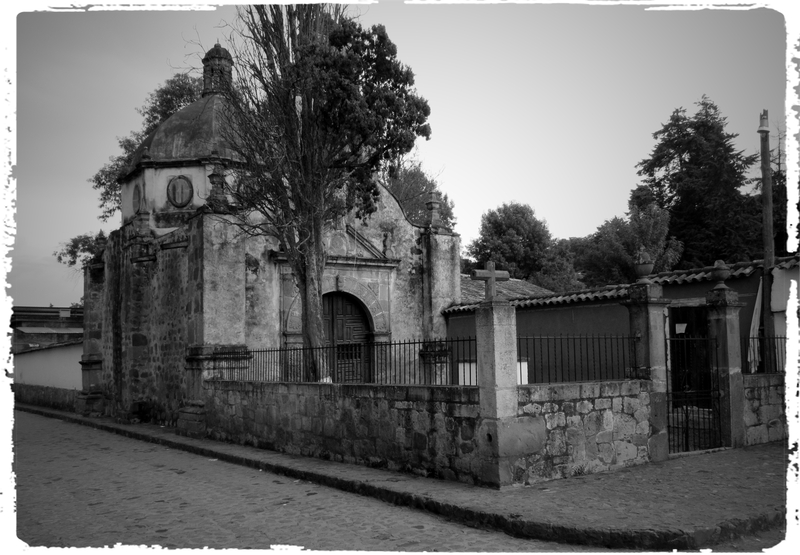 On each visit to Pátzcuaro, I stop at the Chapel of the Humiliated. Not only is it architecturally interesting, but it is chockfull of history. Unfortunately, I have never found it open. Al of my stories are on the periphery of the church. But I find myself in that position often. Señor Cotton: Thanks for remembering the name. I couldn’t, for the life of me, and I could not find it online either for some reason. Of course, the name is that same thing, but in Spanish. Yep, you’re gonna find that baby closed almost always. Must be the blood on the floor. The one time I stopped there, it was open. Very tiny inside. Ah, there’s the proper name. When I got home I looked online. I looked into the two or three tourism books I have. I looked at my big map of the city. Nada. If it was open the one time you stopped there, you were quite lucky. I pass by there fairly often, and it’s invariably locked. You make me laugh about your cell phone, ours are about 7 years old and to text you press the ABC button three times to get the letter C. We did not text more than a couple of times. Several years ago I broke my leg and got a very nasty blood clot and had to go to emergency every morning for two weeks to get a shot in my stomach. Cheapie that I am I had hubby sometimes wait outside with the car and not pay for parking at $4.25 per hour, I will just text you when I am done! Could not remember how to text, so called him, call did not go through, and I am stuck in one of those stupid wheelchairs that only works with a person behind you pushing it. Lucky Pete’s phone rang once and stopped so he came looking for me. I know my camera is smarter than me! Shelagh: My cell is almost certainly seven years old or more, but it works fine. Yes, I have to punch the button three times to get the letter C too, but I am used to it, and my messages are very, very brief. Ninety-nine percent of them are to my wife. Jeez, $4.25 an hour for parking! We were in the state capital last week, and we parked in a very nice, interior lot and paid the equivalent of 90-cents an hour. I got a good haircut yesterday and paid $1.80, including the tip. How do people afford to live in the United States?